This is powerful material which will certainly increase your understanding of how God used the prophets to warn, test and ultimately bring the blessing of redemption and faithful obedience to the children of Israel. Gary V. Smith reaches beyond traditional presentations of Scripture and historical data for a unique look at the nation of Israel and her neighbors through each of the writing prophets. Written to serve as a primary text for upper-level college/seminary courses on the prophets, or as a supplemental text for preaching classes, Smith uses current communication theory and sociology to evaluate the effectiveness of the Old Testament prophets. Each chapter has a section on social setting that sets the historical context as well as an explanation of the social structure to establish the role and authority, or lack there of, of the prophet. 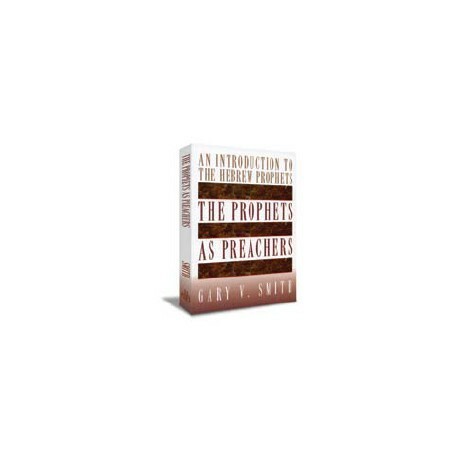 The result is a behind-the-scenes look at God's use of the prophets as change agents in terms of their persuasiveness, communication, technique and theology. This is powerful material that will certainly increase your understanding of how God used the prophets to warn, test and ultimately bring the blessing of redemption and faithful obedience to the children of Israel. Each chapter ends with a discussion of the theological and social implications of the prophets for contemporary preachers, and discussion questions with PC Study Bible's in-program fill-in utility for classroom or individual use. Also, click here to save 50% on The Prophets as Preachers when you purchase it as part of the 5-volume Old Testament Study Collection.